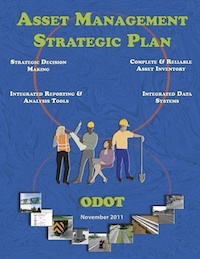 The Oregon DOT – Asset Management Strategic Plan is available here. This AMP is based on a review of asset management practices and the principles from AASHTO’s Transportation Asset Management Guide. The asset management goals, as outlined in the document, are: foster integrated decision-making, establish a statewide inventory, develop an integrated data system, and create integrated reporting and analysis tools. An implementation plan has been made to reflect each one of these objectives. This document includes the following sections: Data Management, Introduction, Inventory and Condition, Objectives and Measures.